The Veterans Affairs Airborne Hazards and Open Burn Pit Registry helps service members and veterans report exposures to airborne hazards such as burn pits, oil well fires and other forms of pollution and document their health problems. According to the U.S. Department of Veterans Affairs, there are currently 25 million living individuals who have served in the United States' armed forces. Hundreds of thousands, if not millions of these living veterans were exposed to toxic asbestos-containing materials during military service. According to a revealing statistic, more than 30 percent of Americans beset with a terrible disease called mesothelioma were exposed to asbestos during military service. What is mesothelioma? It is a rapacious cancer that attacks the internal lining of the lungs, abdomen, and heart. Widely used by every military branch, asbestos was highly regarded for its heat resistance and fireproofing capabilities. In fact, asbestos was so valued that the military even mandated widespread usage before eventually phasing out the material in the 1970s. Most military divisions utilized the caustic substance mainly for insulation purposes, but more than 300 products containing asbestos were used by the military, primarily by the Navy from the 1930s through the 1970s. Every ship and shipyard built by the Navy before the mid-70s was fitted with numerous asbestos-containing materials. Asbestos.com offers information on mesothelioma & veterans, as well as a complete list of occupations, ships, and shipyards that could have put our Veterans at risk for developing a mesothelioma disease. Additionally their Veterans Assistance Department offers extensive experience in filing VA claims and can help any veteran coping with mesothelioma receive benefits from the VA system. This group is dedicated to spreading the word about the dangers and serious toxic effects of the trash burning pits still in operation on U.S. military bases in Iraq and Afghanistan. Two pits in Balad have since been replaced with incinerators, but other bases in Iraq and Afghanistan still operate huge burn pits, and the black, noxious fumes from them still waft across the bases. "Troops in both theaters (Iraq & Afghanistan) have reported respiratory problems, cancers, neurological diseases, heart problems and other issues that they believe are linked to exposure to smoke from the pits. Cases of respiratory illnesses among active-duty troops have risen steadily since 2001." Our mission is to spread awareness and spur discussion about the issue of burn pits and their possible solution. Over $30 billion dollars is available through mesothelioma and asbestos trust funds. Filing for compensation from a trust fund can be a complicated process, but we can help. Throughout the 1920’s to the late 1970’s asbestos contaminated materials (ACMs) were used aboard many military vehicles and vessels. Asbestos was used in insulation, ceiling and floor tiles, pipe coverings, and in brakes and gaskets. All these materials were found on navy ships, aircrafts, and in military barracks. Hundreds of thousands of military men and women were exposed to asbestos because of these materials. Asbestos causes different debilitating diseases, like asbestosis and mesothelioma. Mesothelioma is a cancer in which asbestos fibers become lodged into the lining of the lungs, heart, and abdomen. Tumors begin to grow because of these fibers. 3,500 people are diagnosed with mesothelioma per year, and one third of those are veterans. The average life expectancy for patients with mesothelioma is 6-18 months. There is currently no cure. Mesothelioma Guide is a website that offers easy to understand information about mesothelioma diagnosis, treatment options, and prognosis. We offer free mesothelioma information guides that include valuable ways to improve a patient’s prognosis. We also offer a unique doctor match program that matches patients with an experienced mesothelioma specialist. We advocate for asbestos and mesothelioma awareness with free wristbands. MesotheliomaHelp, America’s Mesothelioma resource, is one of the web’s primary resources for information on malignant mesothelioma and other asbestos-related diseases. Our team of writers, supporters and sponsors of this site are dedicated to bringing the latest, most comprehensive mesothelioma information to patients, families and caregivers. Our goal is to provide the appropriate information to families battling mesothelioma to empower them to participate in making the decisions about their care, and to offer some measure of hope and support. We are here to educate and support mesothelioma patients and their families. Research has shown the more you know about a disease, the better prepared you'll be to cope with everything that comes your way. So, let's learn, share, and take action together. and referrals to experienced mesothelioma doctors. We are the only healthcare providers in the Indianapolis area, which we know of, that provide this free service for our troops. While deployed to the Middle East in 2008, Dr. Chris Sherman would treat troops with back or neck pain for free in his spare time. (Dr. Chris was not deployed as a chiropractor.) The chiropractic care was very beneficial and greatly appreciated. After returning home, Dr. Chris felt he should carry on this free service back in the states. As an Air Force Veteran, and still an Air Force Reservist, Dr. Chris feels he owes the military for the life he lives right now. That is why we are offering this benefit for those who have put their lives on the line defending our country. So, if you know of any veteran returning from Afghanistan or Iraq, please let them know we would love to help. The Patriot Project provides chiropractic care to active duty military, their families, service connected veterans and all gold star dependents free of charge. We have doctors in all fifty states. The A Soldier's Smile events are philanthropic cosmetic and restorative dentistry procedures given to U.S. soldiers in need of professional dental care. Our troops deserve a reason to smile and participating dentists from the Academy of Comprehensive Esthetics (ACE) will be providing the necessary cosmetic and restorative dental care to select troops to reach this goal and to show our nations appreciation for their time spent serving our great country. The soldiers will be receiving treatments at individual ACE cosmetic dental practices across the nation and the coverage will be fueled by local and national media outlets to promote awareness. The mission of Catch a Lift is to help wounded post 9-11 service members start and maintain their healing process, both mentally and physically, through physical fitness by providing them with gifted gym memberships or home gym equipment, anywhere in the United States. It’s open to both men and women who are Veterans or Active Duty Service Members, in all branches the military, the National Guard and the Reserves. All able-bodied Veterans, including amputees, are eligible to participate and discharge status is not a factor. The Warrior Health & Fitness Program combines the expertise and excellence of the Boston Red Sox, Massachusetts General Hospital Sports Medicine Department, Home Base, and leading collegiate exercise science programs at Northeastern University and Florida Gulf Coast University. Operation Live Well has a singular focus: YOUR HEALTH! 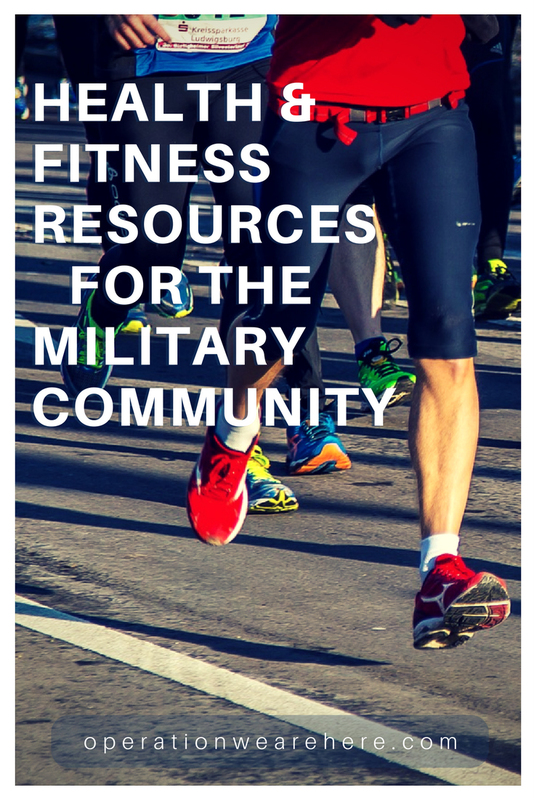 This site is specifically designed for every individual in the military community - to provide tools that you can use today, as well as information and resources that can help sustain or improve your health, and help you lead a healthy lifestyle. The mission of Veterans Alternative is to serve veterans experiencing post-traumatic stress related to combat and/or military sexual trauma and their families through a resiliency & strength-based program utilizing proven alternative therapies. Deployment can be a stressful and uncertain time for our nation’s servicemen and women and their families. In partnership with the Armed Services YMCA and the Department of Defense, the Y is proud to offer memberships and respite child care services to eligible military families and personnel to give them extra support during this difficult period. It’s our way of giving back to those who dedicate themselves to serving our country. Our Get Healthy initiative includes partnerships with various organizations providing opportunities to participate in these and more. Semper Fidelis Health & Wellness is a community based nonprofit corporation founded by two US Marine Corps Veterans. We are proud to be the FIRST and ONLY Integrative health and wellness solution providing health and wellness education and programs to our nation's Wounded Warriors, Active Duty & Reserve Military, Veterans, First Responders and their families. My HealtheVet is the VA's Personal Health Record. It was designed for veterans, active duty Servicemembers, their dependents and caregivers. My HealtheVet helps you partner with your health care team. It provides you opportunities and tools to make informed decisions. We Honor Veterans, a program of the National Hospice and Palliative Care Organization (NHPCO) in collaboration with the Department of Veterans Affairs (VA), invites hospices, state hospice organizations, Hospice-Veteran Partnerships and VA facilities to join a pioneering program focused on respectful inquiry, compassionate listening and grateful acknowledgment. By recognizing the unique needs of America’s veterans and their families, community providers, in partnership with VA staff, will learn how to accompany and guide them through their life stories toward a more peaceful ending. TRICARE is the health care program serving Uniformed Service members, retirees and their families worldwide. TRICARE's Nurse Advice Line is available to all TRICARE beneficiaries in the United States, 24 hours a day, 7 days a week, by calling 1-800-TRICARE (1-800-874-2273) and selecting option 1. The Nurse Advice Line is staffed by registered nurses who answer urgent health care questions. They give beneficiaries professional health care advice to help determine if self-care is the best option or if you or your family member should see a health care provider. The Nurse Advice Line is not intended for emergencies and is not a substitute for emergency treatment. If you think you may have a medical emergency, immediately call 911 or go to the nearest emergency room. Dreams for Veterans serves our nation’s military communities by giving back to terminally ill veterans and their families through the fulfillment of a final dream. Final dreams range from basic need items (like a working appliance or mobility scooter) to bedside reunions, final vacations with family, “meet and greets” with personal heroes or reconnecting with aspects of former military service. A dream not only serves the recipient, but also brings comfort and peace to caregivers, loved ones, hospice professionals, veterans affairs and service officers, and all those they serve in communities across the nation. We serve veterans in all 50 states and partner with America’s hospice professionals and veterans organizations to meet the unique needs of our nation’s veterans. Veteran Homestead provides medical, psychological, and spiritual care to veterans that are diagnosed with a terminal illness, are elderly and/or disabled or otherwise in need. We provide these services without regard to race, religion or sexual orientation. All of our programs are drug and alcohol free and every effort is made to help those seeking abstinence. The yoga program at My Warrior’s Place includes trauma-sensitive yoga as developed by Warriors At Ease and iRest® yoga nidra, which is a form of meditative self-inquiry from the teachings of yoga. iRest® has been proven through military research to induce deep relaxation throughout the body and mind, eliminate stress, overcome insomnia, solve personal and interpersonal problems, resolve trauma, neutralize and overcome anxiety, fear, anger, and depression. The Exalted Warrior Foundation facilitates an adaptive yoga instruction program that is designed for wounded warriors in the active military, veteran hospital facilities, and veterans within communities around the country. Healing for Veterans: The Role of Yoga Therapy for PTSD - Over two million American service members were deployed to Iraq and Afghanistan. Today, one in three is coping with PTSD, traumatic brain injury or another stress-related disorder. Some could lose their silent battle: nationwide, veterans account for one out of five suicides. And countless other veterans are coping with stress and chronic pain from non-combat injuries. Give Back Yoga is committed to supporting these warriors and their families through Mindful Yoga Therapy, a program designed to help vets find a calm and steady body and mind through the practice of yoga, meditation, breath work, yoga nidra and meditation. Each practice is a tool that veterans can use to cope with post-traumatic stress, and together they form a comprehensive system — a “toolbox” — that can help warriors transition into a life of strength and resilience. G. I. Yoga which offers yoga classes free to veterans and their family members. Yoga is a powerful agent of change, and not simply a form of exercise. Within a safe community of fellow veterans and their family members, you will learn practices to release stress, sleep better, ease aches and pains, lower blood pressure, increase strength, flexibility, balance and focus, and develop tools to help manage the symptoms of PTS and TBI. This is your chance to discover the benefits of yoga: vigor and vitality, balance, peace, and a sense of well-being. No prior experience is needed. *Mats, blocks, straps and blankets provided. Just show up! Therapeutic Yoga - The Big Red Barn Retreat is honored to partner with Begin With Yoga and Wellness to offer therapeutic yoga for those suffering from combat related stress issues, traumatic brain injuries, and physical injuries or aliments. Private classes for those suffering from combat related stress issues can be scheduled by contacting Ginger Doughty at (803) 315-0390. Open yoga classes are also available on Mondays at 6PM and Thursdays at 4:30PM. ​We're proud to share our yoga and meditation videos for FREE for everyone to use and share! We've offered a huge range of practice from Chair Yoga to Yoga for Veterans, and many of the videos are in Spanish. Veterans Yoga Project is an educational and advocacy organization dedicated to improving the health and well being of military veterans. Working in partnership with veterans, active-duty military personnel, student veterans organizations, and other non-profit organizations, Veterans Yoga Project supports recovery and promotes resilience among veterans, their families, and their communities. This website is for war or conflict veterans that served, or are currently serving, in the United States military. We list studios, gyms, teachers, and veterans' hospitals that offer at least four free classes to combat veterans. Yoga For Vets simply wants to allow veterans to see the benefits of yoga through four free classes. Take free classes! See what yoga can do for you!